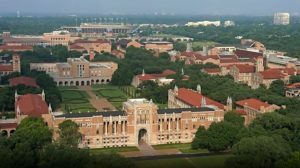 Rice University: Set in the heart of Texas Medical Center (TMC) in Houston, the nation’s fourth largest city, Rice is consistently ranked as one of the nation's best teaching and research universities. TMC is the largest medical complex in the world and is at the forefront of advancing life sciences with one of the highest concentrations of biomedical researchers. Forty-six hospitals and research institutions are TMC members, including Rice University, University of Houston, MD Anderson Cancer Center, University of Texas McGovern Medical School, and Baylor College of Medicine. Center for Theoretical Biophysics (CTBP): CTBP is one of ten Physics Frontiers Centers established by the Physics Division of the National Science Foundation Directorate for Mathematical and Physical Sciences (MPS). CTBP is also sponsored by the Division of Molecular and Cell Biology (MCB). Additional support comes from the Division of Chemistry (CHE) and the Division of Materials Research (DMR). CTBP represents a collaboration between researchers at Rice University, Baylor College of Medicine and the University of Houston, and is housed in BRC. CTBP encompasses a broad array of research and training activities at the forefront of the biology-physics interface. Gulf Coast Consortium (GCC): The Gulf Coast Consortia, formed in 2001, is a collaborative organization of seven academic institutions in the Houston-Galveston area: Rice University, Baylor College of Medicine, University of Houston, University of Texas Health Science Center, MD Anderson Cancer Center, University of Texas Medical Branch at Galveston, and Institute of Biosciences and Technology. Its mission is to foster, coordinate, and facilitate inter-disciplinary, inter-institutional training programs and research initiatives at the frontier interfaces between biological/biomedical sciences and mathematical, chemical, physical, and computational sciences and engineering and to coordinate effective administration of its multi-institutional programs by lowering barriers for students and faculty, serving as a model of cohesion, and creating dynamic communities. Interested in becoming a sponsor? Download our sponsorship PDF for more information or contact Brian Munsky at qbio_summer_school@colostate.edu.